That means I’m 49,24% Financially Free (up 2,75% from last month). “Crowdlending (except Bondora)” reached 1.047,50€. First time over the thousand Euro line. Yay! Another negative month on Bondora. 170,27€ interest received but 412,51€ principal missed. 135,62€ was recovered from loans in default in January. Not enough to turn the numbers green. One of the projects I invested in on Crowdestate, MMMSprattus OÜ, is not going according to schedule. If I understand correctly, MMMSprattus was supposed to use the money to expand their production facility, but it seems like they’re behind schedule building the facility. Crowdestate has sent a cancellation application and claim to MMMSprattus, so if they don’t fix the matter before February 6th, they will go through legal processes to get the money back. The rest of the projects in my Crowdestate portfolio are performing as expected. 4 new projects were released on Crowdestor in January and my interest earned keeps rising as well. I’m very pleased with the progress of this platform. Crowdestor just added another project offering a 19.5% interest rate per year with a 24 month duration. I will definitely invest in that! There’s still 4 days until the project is released to investors, which gives me time to transfer my money in time. Envestio is back in the game with 10 investment opportunities in January. It was a mix of new projects and new tiers of existing projects. The interest rates offered last month were between 15-17.5%. Somewhat lower than the 20% they offered on the first projects, but still pretty good I think. I’m still curious to see if we will see any 20% interest rate projects again. My FastInvest portfolio is stable and reliable. I’ve invested in 15% loans only and haven’t made any deposits since 06.06.2018. You can already begin to see the effect of compound interest. I know the team is working hard to finish the new version of the website. I’m really looking forward to seeing it in action, it should be released within the first half of 2019. There’s no cash drag on Grupeer anymore. Several investment opportunities from 10-14% are available now. 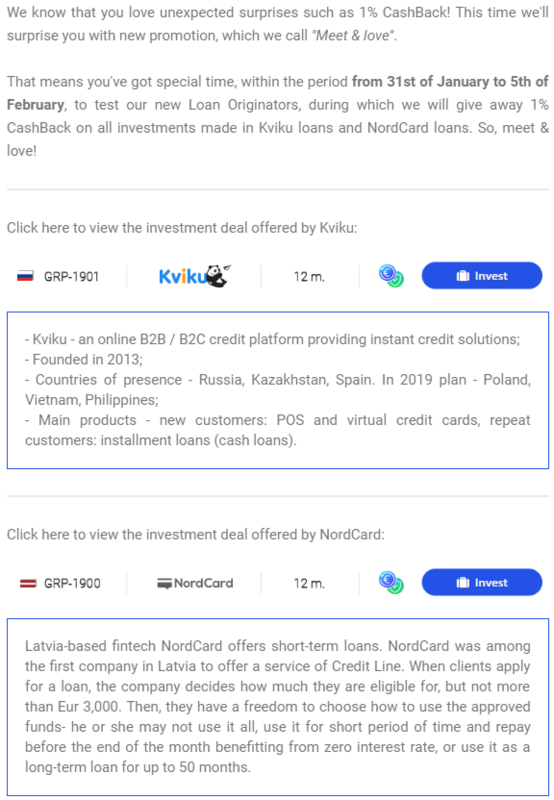 They also added two new loan originators recently, Kviku and NordCard. A few days ago, all investors received an email, offering all investors (new and existing) 1% CashBack on investments made in these 2 loan originators within the period from 31st of January to 5th of February. I sold most of my 11-12% long-term loans on the secondary market because I wanted to exchange them for the 13-14% loans which are now available. For that reason I missed some interest in January, but I’d rather have higher paying loans and benefit from the higher returning loans in the long run. Robocash is still giving a nice profit and effortless investing experience. All loans now come with a fixed 12% interest rate and most of them are short-term (30 days or less). Accrued but unpaid interest (because loans are still outstanding) is slowly building up every day. This amount will be paid out when the 1-year installment loans mature. Even though Swaper put 3,5 million Euro’s worth of loans on their marketplace during the last 30 days, 25-40% of my funds were not invested in January. I’m considering giving up on Swaper and move my money to a better place. You know, somewhere where they actually get invested. It’s kinda sad, because I’ve been satisfied with the platform up until recently. Twino is almost as annoying as Swaper in terms of Cash drag. I mean, Twino actually has loans available, but I don’t like their “Payment Guarantee” loans with 8-10% interest rate. If they default, you’re stuck with them until the maturity date, as they can’t even be sold on the secondary market. January was a different/difficult month for my rental property. On of the tenants didn’t pay the rent and I was very close to terminating the contract. The money came in just in time so the tenant stays for now. The other tenant sent a “termination of lease” notice, which means they will be moving out on 1/5 (They have 3 months notice). So I will need to find another tenant for that apartment soon. The rent was increased 0,8% for my tenants. ( I raise the rent every year to match the changes in the “Net price index”). For this reason, income on the rental property grew 12€, from 660€ to 672€. I have talked to a real estate management company which offers to handle some of the administration for me. It’s quite cheap so I decided to give it a try to get first hand experience with them. My savings rate for January was 69,40% (+47,14% compared to last month). I receive 865€ in child benefit every 3rd month, which helped raise the savings rate for January. Savings rate for January 2019 = 69,40%. The blog traffic reached new heights in January. FinanciallyFree is hosted on SiteGround for the incredible low price of 3,95€ per month. Even with almost 10k visitors and 43.000 page views per month it’s still pretty fast don’t you think? In February I’ll throw some money after the Crowdestor “Energy production plant” project. I’m thinking about making a 5.000€ deposit to increase my investment on Crowdestor to 15.000€ in total. If you enjoyed this post, please hit the like button below and/or share it with your friends. P.S. If you missed the latest Podcast episode with my friends from Financial-independence.eu you can listen to it on my About page. We talk about P2P lending, minimizing risk, surviving recessions and auto-invest strategies. Another excellent month and update Jorgen, thank you! You’re investments are still doing awesome, and even though your blog income is down a bit this month, it is still something the rest of us bloggers can only dream to achieve 🙂 Visits are still growing to your site each month and you’re almost to that 10,000 that we all try to attain! Thanks again for taking the time to publish the update. You and I both know how long this takes so please accept my sincere appreciation for the effort. Thank you, I love your updates as well! You’re right, one update is actually a lot of work, but knowing that 10.000 people will benefit from it for an entire month makes it well worth it! Hi Jørgen, thanks for another update. Congrats on surpassing the 1000€ milestone, although it doesn’t include Bondoras it is still nice to see how your money compounds and gives you more passive income month by month, your journey is very inspiring! It’s nice to know that my investments add a 1.000€ deposit every month, as I reinvest the earnings. That should get the snowball rolling. It’s the first time I have to find a new tenant, so let’s see how that goes. 3 months should be enough to refresh the apartment and find another tenant though. Thanks for sharing your talk with Envestio. Sounds like you had a nice and positive experience like me. I didn’t know about the VIP account benefits, that’s actually really interesting to me. Maybe I should consider getting to 100k eur invested myself. Jorgen, which of the three benefits would you choose for the VIP account? 0% fee on BBG would be a good one if you sold back every loan before the final repayment (trying to avoid defaults on the capital repayment) but not every loan defaults at the end so you would still be open to some capital loss. The 1% additional interest is less interesting as rates with Envestio are already high. But i suppose you could look at this extra 1% as a kind of self insurance like a provision fund..
Hi Sterling. I would definitely go for “100% buyback guarantee in case any of the projects defaults (instead of current instant 80 to 90% recovery, provided by us).” Then your only risk would be if Envestio defaulted, as you would not have any risk of borrowers inability to pay. Default of the Envestio platform itself is less likely to happen in my opinion. They don’t have any maximum so I’m pretty sure they’d let you invest 200k with that option. A couple of my readers have invested 100k in Envestio. Excelent report… thanks Jørgen it is always a pleasure to read! Are you picking up loans (13-14%) on Mintos 2nd market? Btw, do you have plans to release strategies for auto-investing in your blog? Thanks. Have not noticed Auto-Invest strategies on Mintos review article before. Will check it. We also talk about auto-invest strategies in the podcast 030 on my About page. Excellent month there Jorgen, keep it up! The Bondora image “net interest received” is it from Bondora dashboard or your custom made? Would like to see my return as i allocated big part of portfolio to HR spanish loans. The “Net interest received” is a screenshot directly from Bondora’s own statistics page in my account. I just have to take a minute to say way to go, and best of luck with your continued success. It’s a lot of fun for me to see how well you are doing. Another good month of progress, well done! I am still very new to crowdlending and the financial sector in general, so some of the words/terms you use in your reviews and updates are lost on me… Would you consider making a crowdlending vocabulary in the future, or could you maybe recommend one? 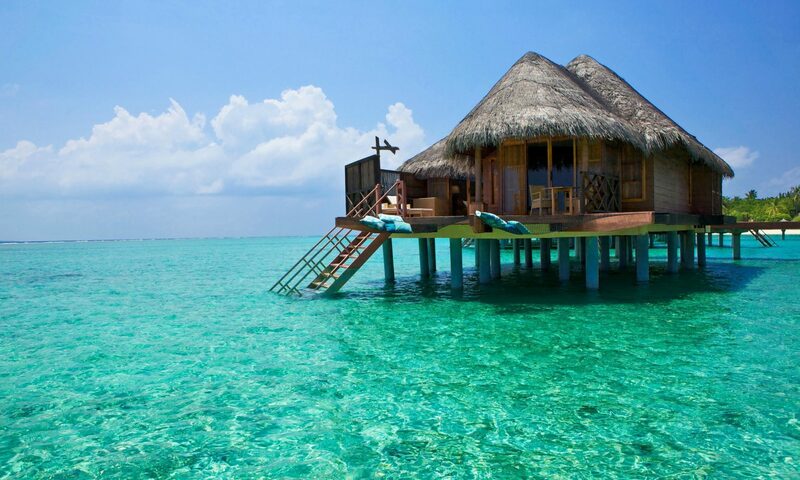 Would be nice to have it here though, as your site has developed to something of a “home-base” for many new investors. I’m not sure which words or terms are specific to crowdlending. The only ones I can think of is P2P and P2B which means Peer-to-Peer and Peer-to-Business. Maybe you can give me some examples? Can you explain me the big increase of January 2018 (see the first graph: Historical view of my portfolio performance) + explain me how you generate income from your blog? Congrats for your blog, open data. One question, if the investment rate is 19.5%. Is it 19.5%/year or 19.5% on the duration of the loan? Interest on crowdlending platforms is always listed per year. Many thanks for the latest update and the very informative screenshots, they are a great source of inspiration. I also have a thought, which could be interesting and would really like to know your opinion. Some of the loans have really high numbers and if you sort them based on APR you will notice that some are not just above 1-200% but actually above 1000 or in some cases 5000% (found one on the secondary market with 10800%). Now this I think is extremely unfair, because this means the borrowers are paying these percentages, and through investing in these loans the investors become part of it. This just came to me when you mentioned moving towards short term loans, since they tend to have higher APR. It is one thing to move as investor to a little higher percent profit, but if it means a magnitude or more higher APR on the paying side of those loans I personally would not invest in those. Luckily it is easy to set the APR criterium to a maximum with those filters. My thinking is maybe after fair trade coffee, fair trade clothing and fair trade gold there could be fair trade P2P loans as well. They may not be working 100% (far from it), but at least they spread the word that there could be fairness problems when the distance is great between business and investor. Thanks if you or others share their thoughts on this. As I’m sure you know, APR is not the interest rate, it’s the combined cost per year in percentage compared to the loan amount. Pay-day-loans are often very expensive because it’s a small amount of money and very short term duration. The cost of issuing the loan is high in fees compared to the loan amount. The people who need these kind of loans are often unreliable when it comes to paying the loan back. Debt collection is expensive and a large amount of write offs must be expected. If those loans were forbidden by law, the alternative for those in need of money, might be worse than the cost of the loan. My conclusion is, that the interest charged is probably fair based of the borrower segment. In February 2018 I bought my first rental property, which added 660€ to the monthly income. The drop in Crowdlending income in the same period, happened for the same reason, as I withdrew 10.000€ from Twino to invest in the property. The blog generates income from affiliate links to the investment platforms I use. thanks for the update and in general the info you share on your blog. It was thanks to you that I recently entered P2P/crowdlending. Since I am still new, could you perhaps explain how come that you are getting only a 7,25% return from crowdestate eventhough none of their projects brings less than 10% return? Yes of course! I calculate XIRR from I start to invest up until current date. About 50% of the projects I invested in have not made any payments yet, as they are Real Estate development projects that only pays back when the project is completed and sold. Then I will get a bullet payment in the end where both principal and interest is returned. The return I have gotten so far, is from the companies which needed capital to grow their business and pay interest on a monthly or quarterly basis. If everything goes as planned the XIRR for Crowdestate will spike to >17% in a year or two. I am really amazed by your progress towards financial freedom. Keep up the good work! Hi Jørgen! I see you invest in a lot of platforms. What about Housers? Congrats on your investments! I’ve just started with some investments on Mintos and Housers, but the real big plan is to buy some real estate on my city to rent it out. BTW, why don’t you withdraw some money from P2P to have the down payment for the second property? I’ve chosen not to invest in housers because the yield is lower than the platforms I’m already investing in. I really like my crowdlending portfolio so I prefer to keep it and save up for the second property on the side. Speaking of which… I have enough money for the down payment now, so I’m looking for good opportunities in the local area at the moment. Great results, especially the affiliate income. That is insane. Anyways, I have followed your blog for a short time, and maybe you have already addressed this previously, but I’m interested in knowing how you feel about having the majority of your assets tied to P2P platforms? Because as I see it P2P platforms and companies have not really experienced a recession, and they have not truly been tested when the global market goes sour. Furthermore, the majority of P2P companies do not operate with a profit, and therefore does not really have a company buffer against a serious market downturn. If Estonian P2P platforms go bankrupt, your loans will most likely be given to associated lawfirms so they can hunt all the defaults that are gonna come, and they will take a large share of whatever money they manage to salvage. In the end a really harsh market downturn might spell disaster for P2P platforms and saving, including the majority of your assets. What is your thoughts on that? Sorry for the late reply. We discuss most of your questions in the podcast episode 030, which you can find on the About page. I feel awesome having most of my assets in P2P platforms. I’ve tried many other investment vehicles and most of them I don’t understand. I don’t know what moves the stock markets or how to tell if a stock is a good buy. I’ve also tried different kinds of trading and it’s not for me. I don’t worry about recessions or things I cannot control in general. I act with the best available information I have right now and don’t look back. The past cannot be changed and the future cannot be foreseen, so why bother? In many cases, if a certain scenario happens, eg. a recession, the outcome is often different than imagined. Take Trump as president for example. Most experts predicted a stock market crash if Trump would win. There was a 30 minute shock and then the bull market continued, even stronger than before. People’s ability to pay back loans have been tested in every recession the world has experienced. If the borrower looses his job, he will have a hard time to keep up with the schedule. In most cases he will be able to pay eventually. In many cases, the lowest paid worker (who needs this kind of loan?) will keep his job and the managers gets fired. In my opinion, the fact that it’s online now doesn’t change much. Good answer to the question about recession, I think it must be something we all wonder about when we invest in P2P, which is pretty much a new alternative investment vehicle that really hasn’t had to weather a downturn yet. Not sure if it’s of interest to anyone but there is one P2P company which did go through the 2008 crisis – Zopa in the UK. You can see how their default rates increased here: https://obviousinvestor.com/peer-to-peer-lending-guide-where-to-start/ (about half way down). You can see although the default rates did increase significantly, it stayed at a manageable level, and Zopa stayed in business. You can also see a bit further down the page how RateSetter (another UK lender) thinks how things would go based on how serious a recession might get. I realize that there are likely not many folks using UK lenders here on your site, and it might not relate to Euro lenders at all, but I find it interesting how these companies prepare for the worst. Have you seen in the stats of any of the Euro lenders where they set out this info? I had a quick look but couldn’t find anything. It would be interesting to know if you’ve spotted anything? Are you staying away from the polish loans at fastinvest to avoid the currency risk, or is there other reason for that? I’m only investing in EUR on FastInvest (and any other platform for that matter). Not because I mind the risk but I like it simple and predictable. I saw that you missed interesting question from JT. Thanks for your input. I’m currently in PeerBerry, Mintos, Grupeer, Envestio, Twino and a minimal position in Crowdestate, as well as a dormant account in Finbee. I’ve recently exited Bondora (got out with what was left of my money more like it), Fixura, and emptied my account on Finbee as it doesn’t have a BB guarantee (though i have to say defaults were minimal and XIRR was around 15%). Given Twino’s cash drag which sometimes goes on for weeks, i was thinking of moving my funds from Twino to some of my other P2Ps, would 5 (6 counting dormant finbee account) P2P platforms be good enough for diversifying fund allocations? Would be interested to know your opinion on this. 5 platforms should be more than fine for diversification purposes (depending on how much you diversify within the platforms of course). I like to be exposed to at least 20 loan originators in total across all platforms. You could easily reach that number on Mintos alone. Everyone’s preference is different, I don’t think there’s a right or wrong answer to this one. A metric based on loan originator is a good one, but i think it needs to be further enhanced with platform diversification, one central point of failure by having everything on mintos for example is very dangerous, staff death, legislation changes, main office catastrophe. In any case you gave your take on it with some figures which helps me get some perspective, thank you. I’m at a point where I have way too much cash while at the same time divesting a 100kEUR P2P account from one marketplace to diversify in a larger number of marketplaces. Any comments welcome! By the way, where does your Bondora XIRR calculation come from? Do you think p2p is a good long term investment? I think P2P is a great short-term, mid-term and long-term investment. I’d recommend min. 6 months.